No, Elon Musk's suggested direct democracy won't solve them. Before humans settle or even set foot on Mars, engineers and scientists have to solve all sorts of problems, like protecting space travelers from dangerous radiation. This will be immensely difficult, but it shouldn’t overshadow other types of challenges — like the legal and political questions — raised by extraterrestrial colonization. In an essay published Tuesday in Aeon, Marko Kovic, a consultant and president of a think tank named The Zurich Institute for Policy Analysis and Research, broke down what he sees as the four most important unanswered questions for the political structures of off-world settlements. First off, Kovic poses the question of who’s actually permitted to colonize space. Should individual nations establish their own settlements, or should that right be reserved for international coalitions? What about powerful corporations? Secondly, there’s the matter of developing laws that are relevant to life on Mars or wherever else. Right now, astronauts are subject to the laws of their home countries, but Kovic argues that it doesn’t make sense to wait the many weeks or months it would take for Earthly legal systems to investigate the first space murderer. Rather, the settlement would need its own legal structure that’s not dependent on Earth. Kovic’s third question may never have a clear answer — he pondered how various nations like the U.S. China might respond differently to rebellious colonies. When should these settlements become independent, if they should at all? Fourth, Kovic argued that, independent or not, policymakers should figure out exactly how various settlements on the Moon, Mars, or anywhere else will all interact among each other and with Earth society. Will they all fall under one governing coalition, or will they be separate entities? 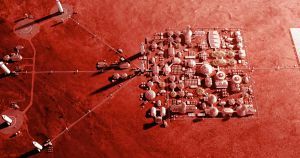 The challenge to each of these comes from the fact that Earthly analogs don’t always hold up — future space societies may find themselves in need of entirely novel governmental structures. On Earth, colonization by and eventual succession from governing nations has often been a bloody mess, so it’s not like we have useful historical examples to guide us. When you factor in the fact that various terrestrial governments with conflicting philosophies and structures (think representative democracies versus dictatorships) will all have interests in space settlements, a crowd-pleasing solution becomes even harder to find. Beyond the 1967 Outer Space Treaty that declares space ought to be explored, not exploited or used for military purposes, there are very few rules that govern space. And even that treaty no longer does as good a job as it used to — Kovic said in his essay that it would prohibit Russia, China, or America from colonizing the Moon or Mars, but not a private entity like SpaceX or Blue Origin. Before we hand the keys to the galaxy over to Elon Musk or Jeff Bezos, perhaps we should take a moment to come up with some updated ground rules. Editor’s Note: This post previously misidentified the think tank of which Kovic is president as “The Zambia Institute for Policy Analysis and Research.” It has been updated.